In a small bowl, cover the wild rice with cold water and let it soak for 15 minutes while you prepare the rest of the dish. Preheat the oven to 350 degrees. In a large non-stick skillet (12-inch) over medium heat, brown the ground beef with the salt and pepper until no longer pink. Drain the grease from the meat. Transfer the meat to a paper-towel lined plate and wipe out the skillet with a paper towel. Return the skillet to the stove top and melt the butter over medium heat. Add the onion, garlic and mushrooms. Cook, until the onions are translucent and the most of the liquid has evaporated from the mushrooms, about 5-7 minutes. Sprinkle the flour over the vegetables and stir to combine. Continue stirring and cook the mixture for about 1 minute over medium heat until it is cooked and golden. Slowly pour in the broth and milk and whisk to incorporate. Add the seasoning salt, pepper, parsley, thyme and paprika and bay leaf. Stir to combine. 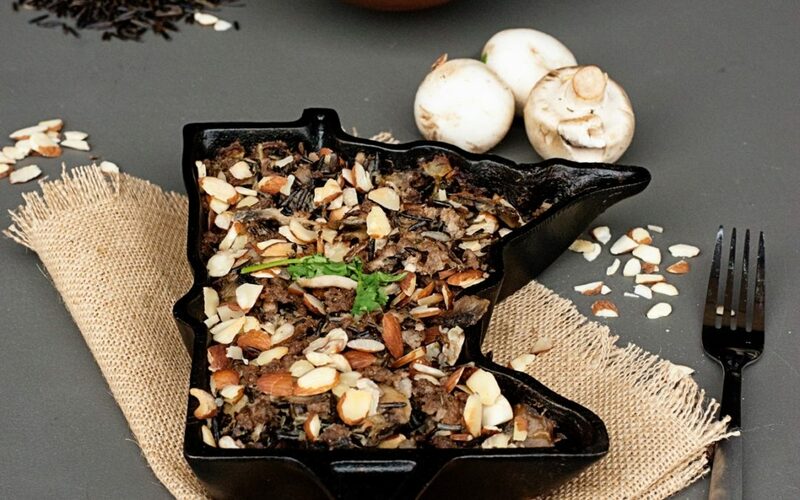 Drain the wild rice. Stir it in to the sauce with the browned hamburger. Transfer the mixture to a lightly greased State Shaped Cast Iron Skillet. Cover the skillet tightly with foil and bake for 1 1/2 hours. Remove the foil, sprinkle with the almonds and bake for another 10-15 minutes until the almonds are golden and toasted and the rice is tender. Uncover skillet, garnish with fresh parsley or thyme, and serve hot.